I have to admit that I got Hunter a Halloween costume this year. Cringe if you will, I couldn’t pass up the opportunity! After much debate over whether he would be Underdog, a dinosaur, or a glow-in-the-dark skeleton, I figured that the skeleton costume would be the most comfortable option. He still isn’t completely into wearing a collar and ID tag, so anything too complicated just wouldn’t work. When Hunter’s costume arrived, I made him try it on almost immediately. He so wasn’t into it (I get it, you’re a dog, not a dress up doll). Eventually he got comfortable enough for me to snap a few staged photos in front of a pumpkin. Since I’m probably going to make him wear his costume at least once or twice more this Halloween season, I decided I should probably treat him to something special. I have a skull & crossbones mold that is the perfect size for dog treats. I also had some pumpkin puree left over from another recipe and a whole lot of oats from stocking up for other recipes. Naturally, I went to work on pumpkin dog treats. 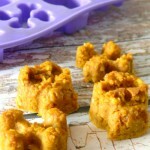 After looking up a bunch of pumpkin dog treat recipes, I decided to try creating pumpkin dog treats with just three simple ingredients: pumpkin puree, oats, and peanut butter. 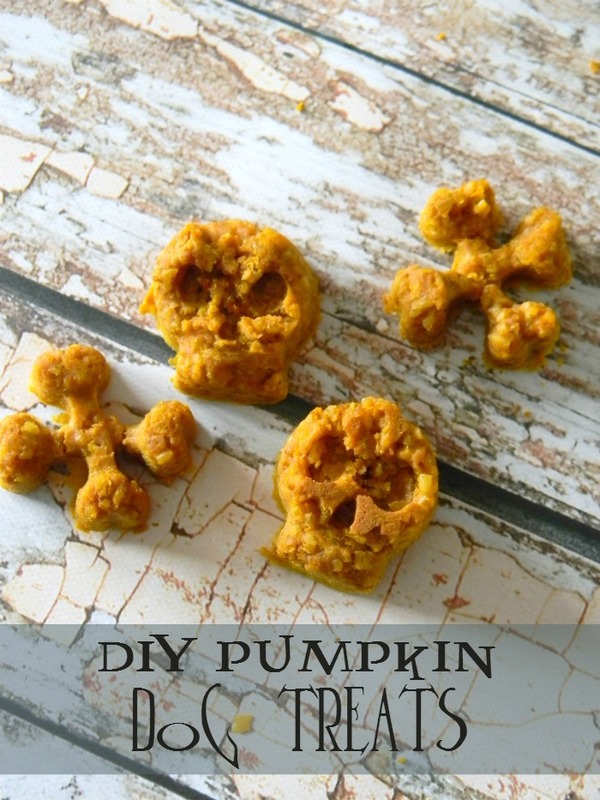 A Halloween pumpkin treat for your dog! Pulse oats in a food processor until you achieve a powdery consistency. Combine all ingredients in a bowl until a dough forms. Drop dough into a mold or drop onto a parchment lined baking sheet to form biscuits. Bake 15 minutes and allow to cool completely before offering a treat for your dog. 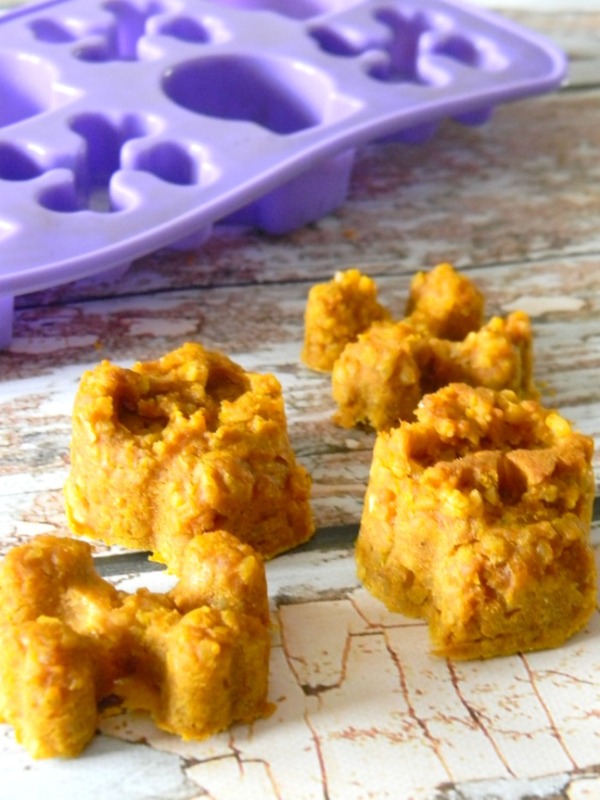 Store pumpkin treats in a sealed container in the fridge up to 5 days. Treats can be frozen for longer storage. Pumpkin contains a lot of health benefits for pets. It’s good for their coats, aids in digestive health, is loaded with vitamins, can actually act as a natural de-worming agent, and more! It’s even recommended to add a little pumpkin to your pooch’s food. Just make sure it’s pumpkin puree, not pumpkin pie filling! 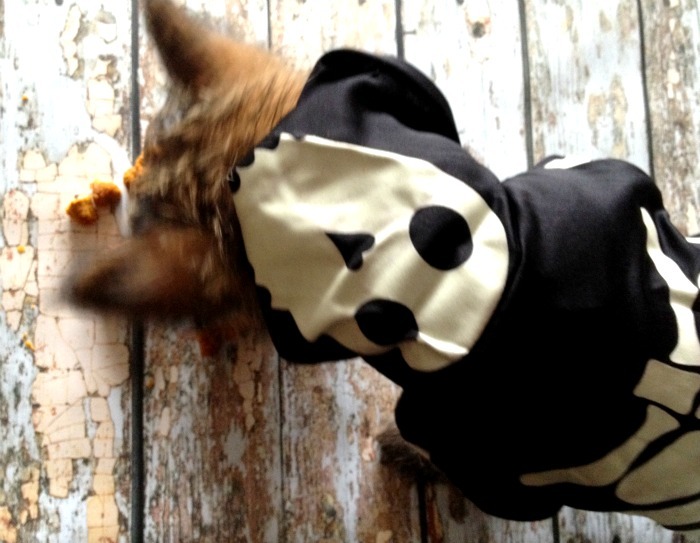 How do you treat your pet for Halloween?